Japan has imposed fresh sanctions against North Korea as it seeks to ramp up pressure on Pyongyang over its nuclear and missile programmes. Chief cabinet secretary Yoshihide Suga said the assets of another 19 entities and individuals would be frozen. More than 210 organisations and people from countries including China and Russia will now be targeted. Businesses on the blacklist include banks, coal and minerals traders, and transport firms. The widening of sanctions comes ahead of a meeting of the UN Security Council to be held on Friday. Japan said it is facing a "pressing threat unseen before" after North Korea fired an intercontinental ballistic missile (ICBM) across its territory in September. "North Korea launched an ICBM ballistic missile that landed in our exclusive economic zone and continues to repeat provocative commentaries", Mr Suga told reporters on Friday. 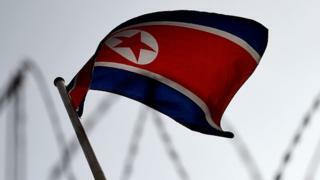 Mr Suga said it would freeze more assets to "further increase pressure" on Pyongyang. Japan already imposes strict restrictions on North Korea, including a blanket ban on trade and port calls. South Korea and the US also impose unilateral sanctions on North Korea, in addition to sanctions enforced by the UN. The UN Security Council meeting on Friday is aimed at finding peaceful ways to pressure North Korea to halt its nuclear and ballistic missile tests, and denuclearize the Korean Peninsula.